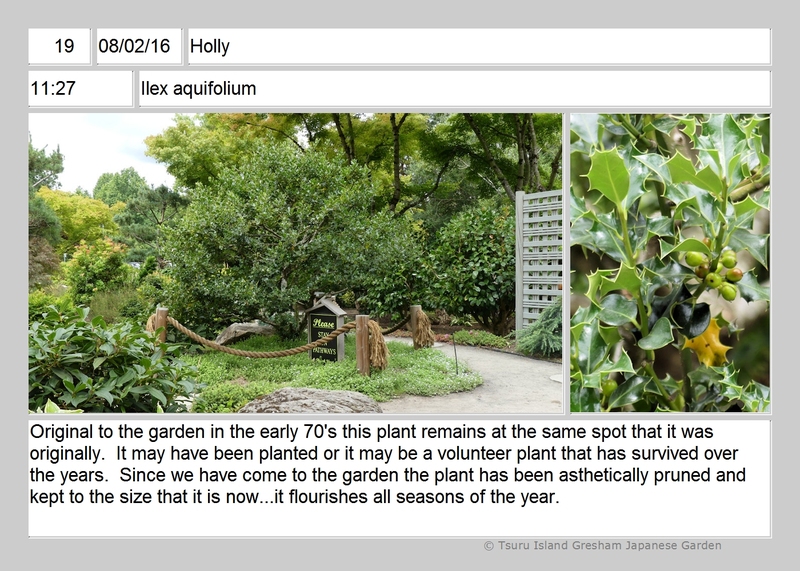 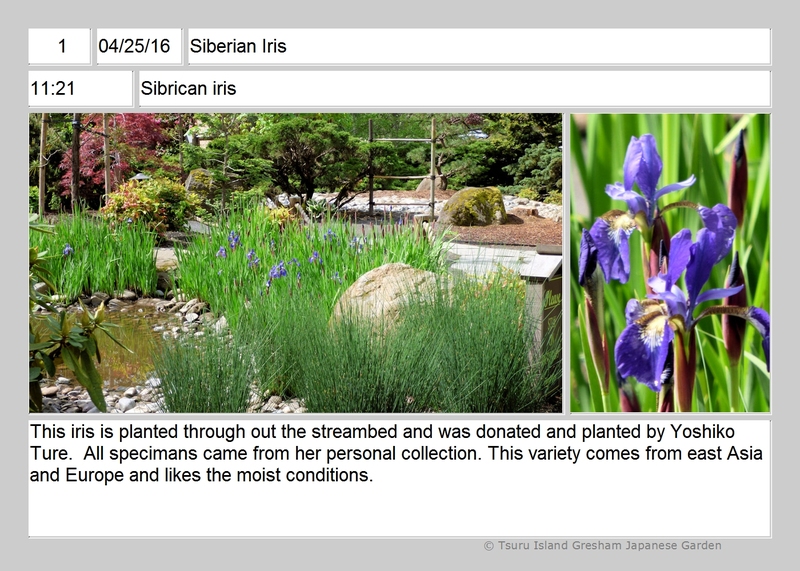 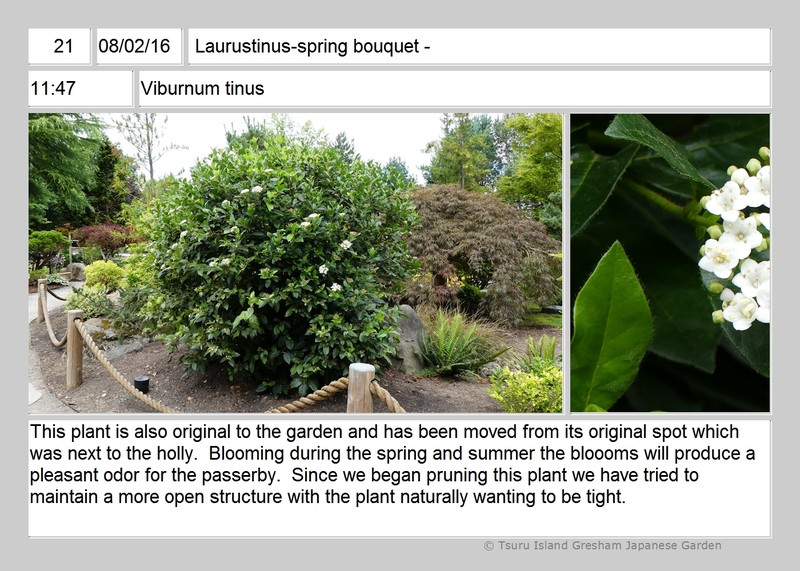 Over the last 5 years we have worked with all of the plants that were part of Tsuru Island and planted by Kaz and the original volunteers. 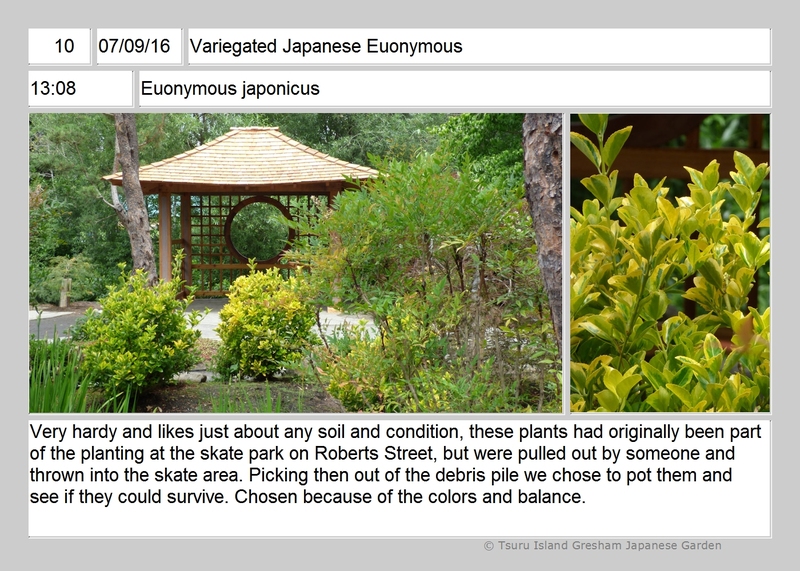 We have heard that some may have come from Japan and other may have come from local sources. 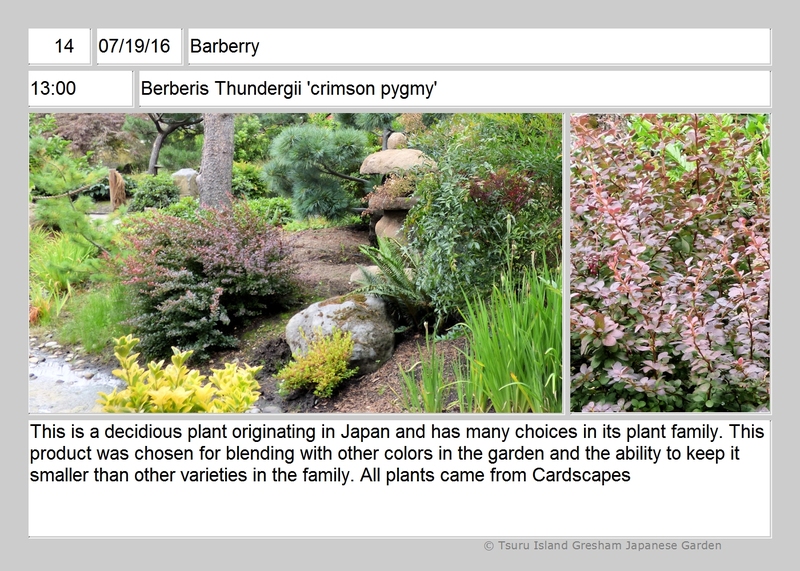 Each plant in the garden has its own story about where it came from, why it was chosen and placed in that particular spot. 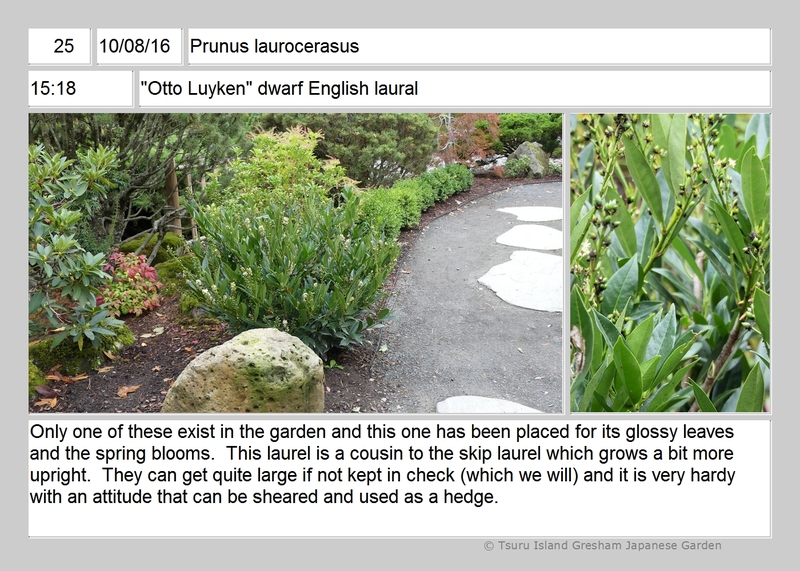 We have had many questions about the individual plants in the garden, and asked if we could find a way to record and save information about each plant. 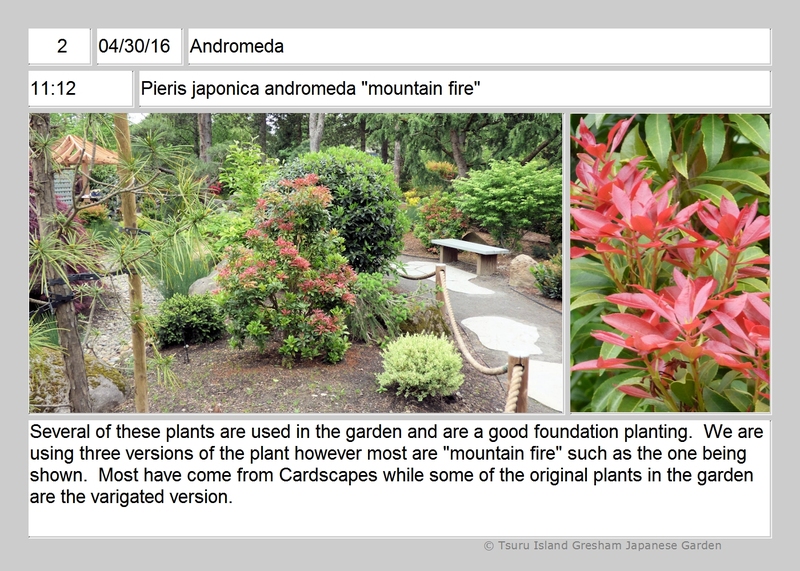 To develop a method to answer these question we formed a group which included Sue Hughes, our web developer, Bill Peterson and Jim Card. 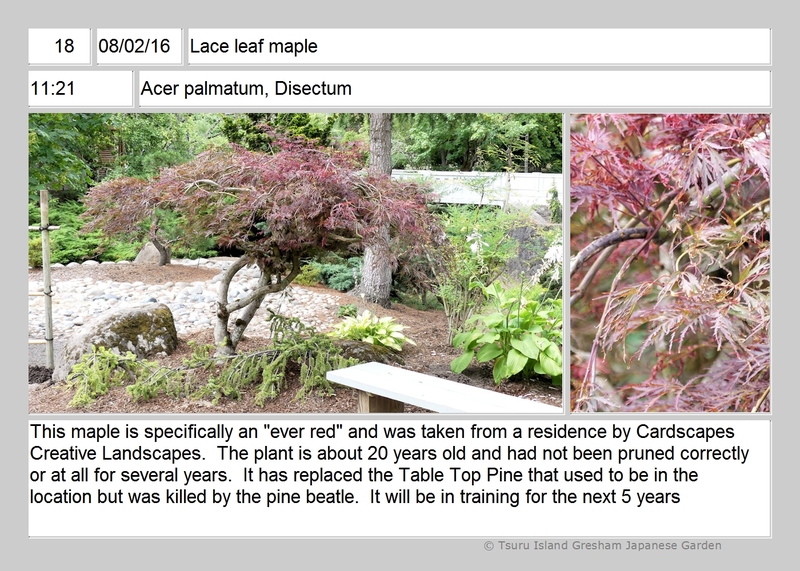 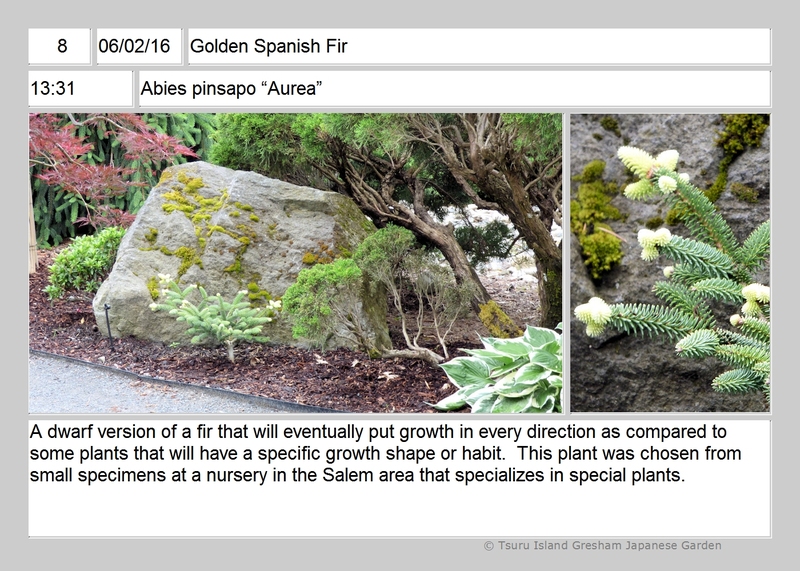 Our decision was to provide general information in an accessible, informative, and fun manner, and to do this in a way that illuminates the style, meaning and enjoyment of a Japanese garden. 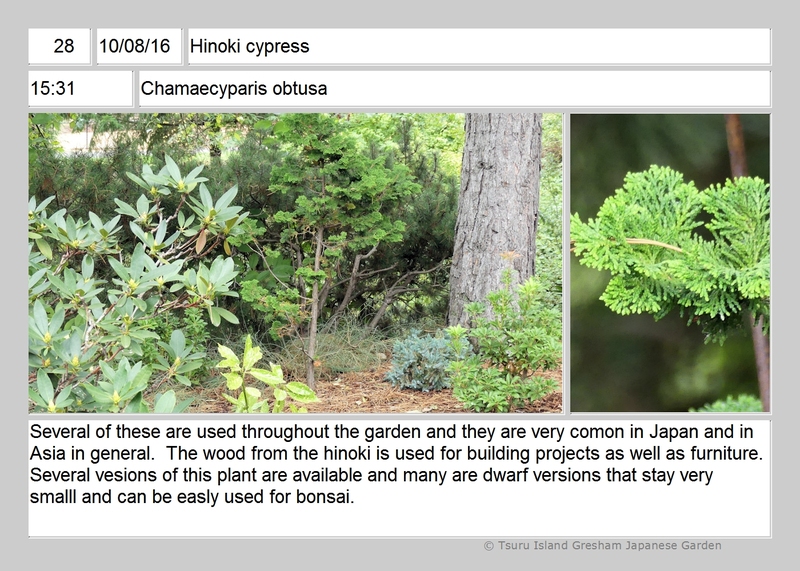 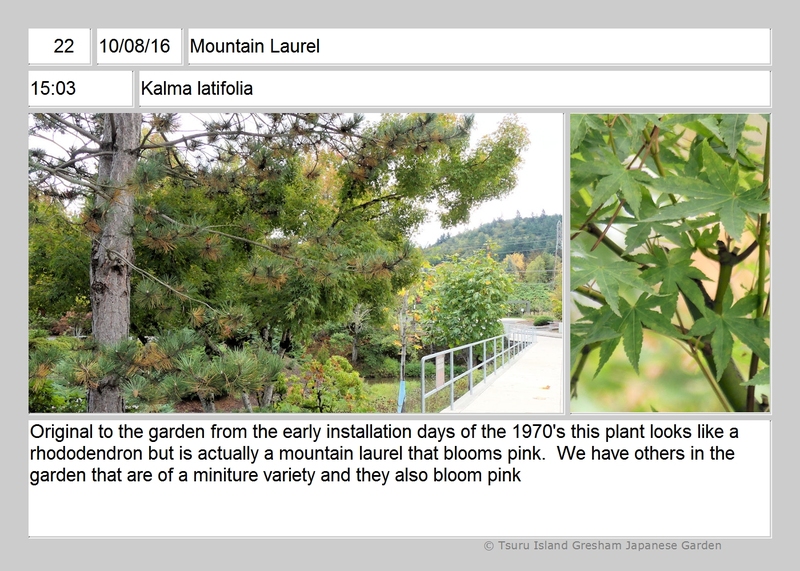 We decided to leave detailed botanical information to the many other sources where this information is availability. 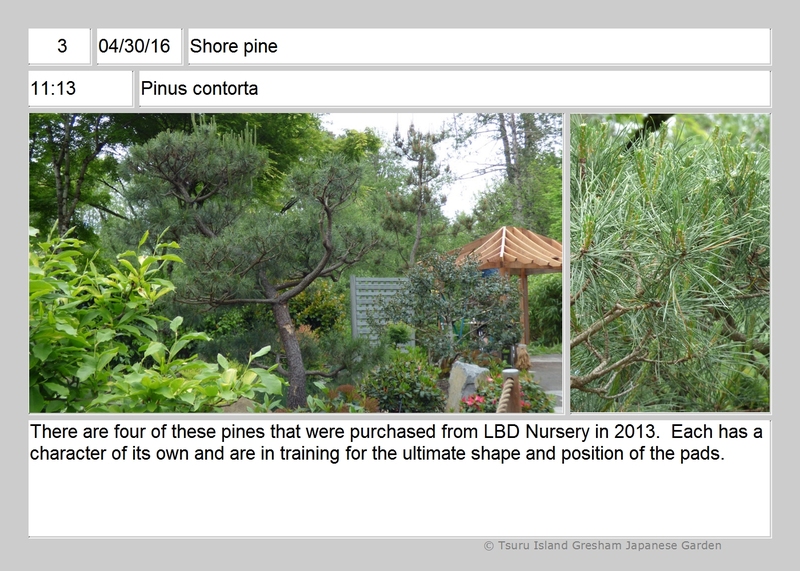 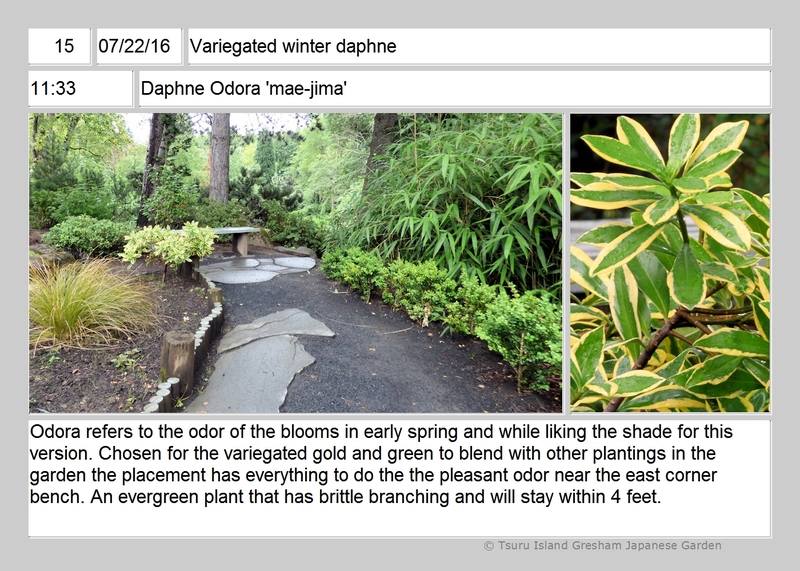 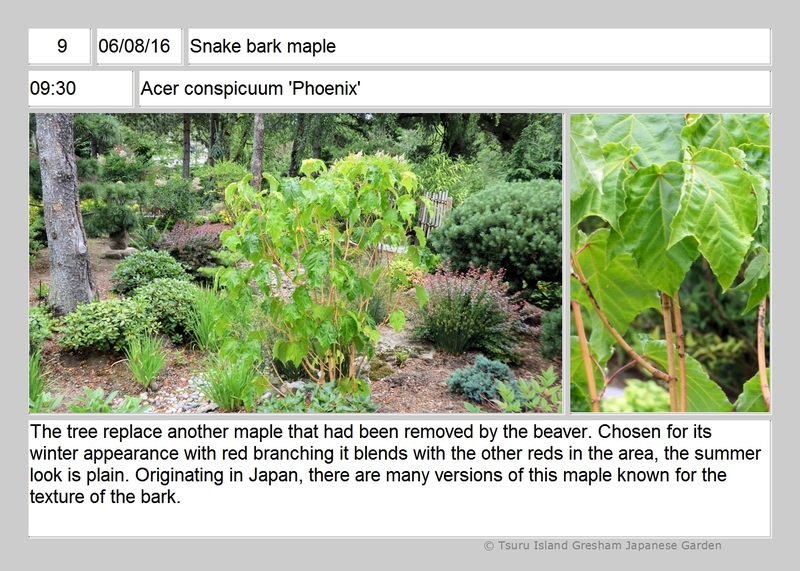 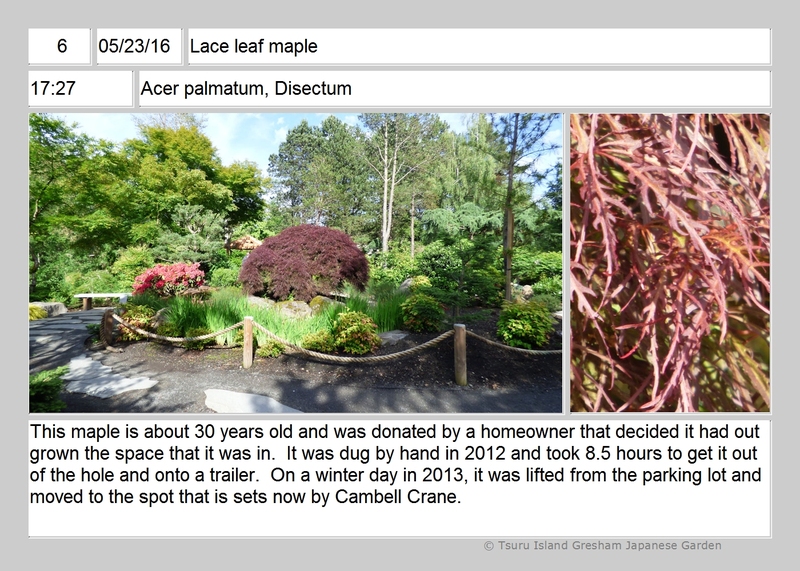 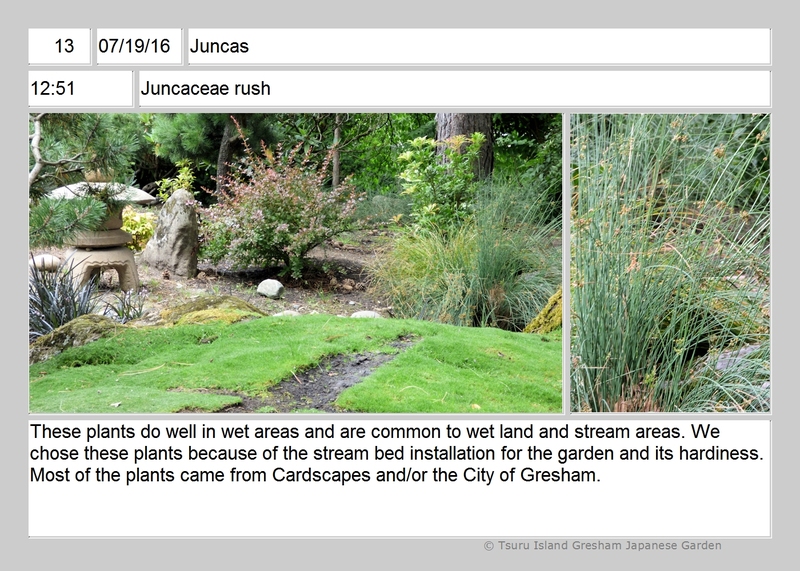 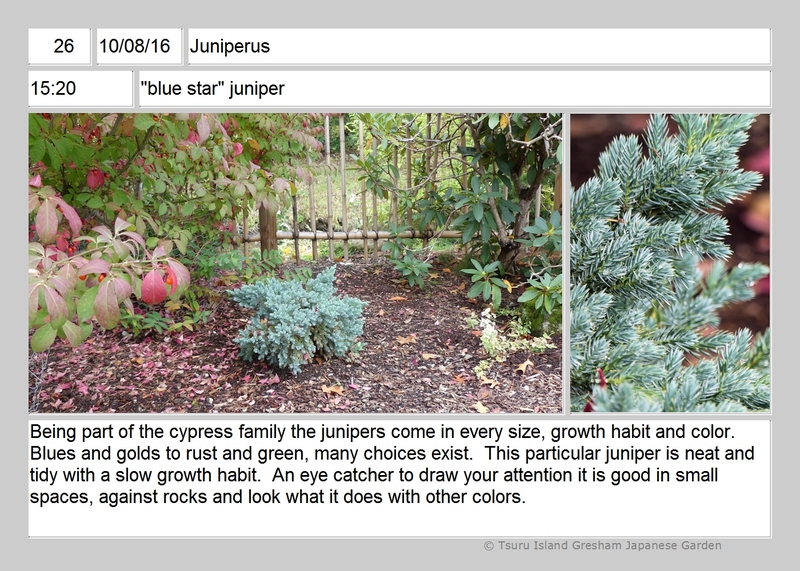 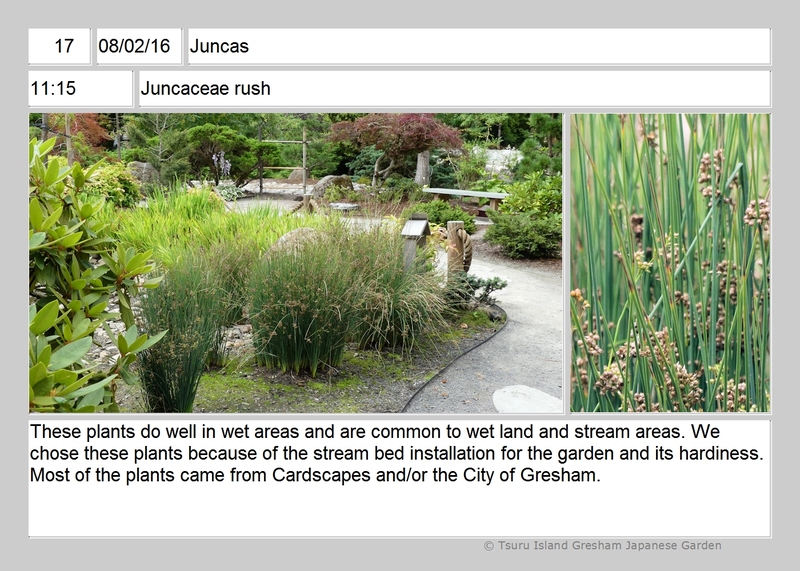 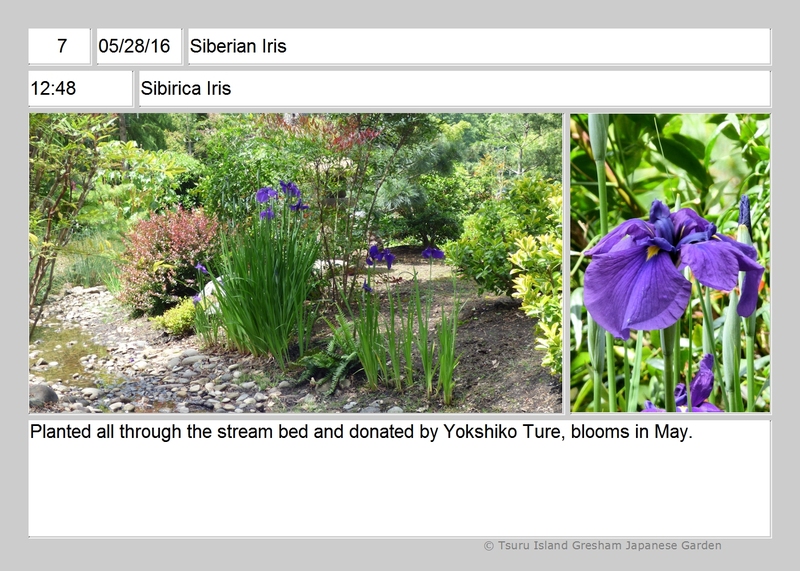 Our core idea is to provide what we titled “Jim’s Garden Notes.” Each Garden Note will feature one plant on a 5 x 7 JPEG digital file which will include a wide angle and close up photo, the common and scientific names and some descriptive information of interest. 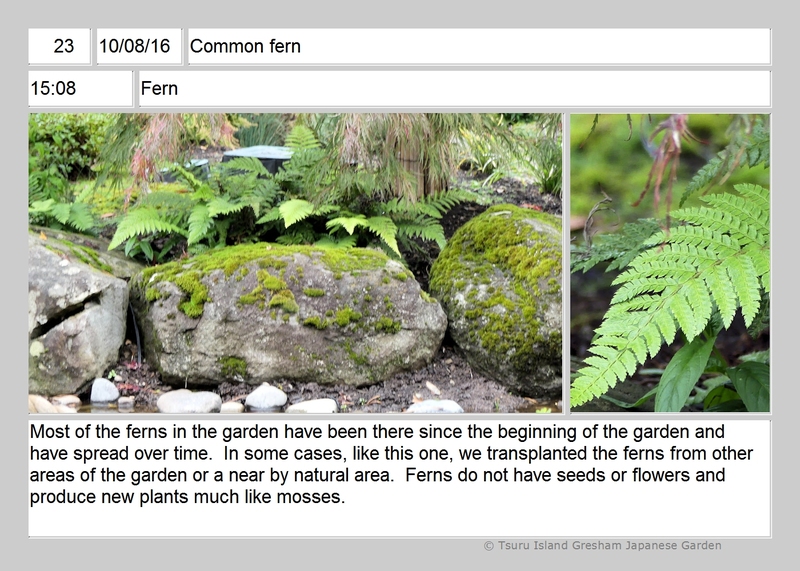 A few of these Garden Notes will be added here, and a list of all such Notes will be available for downloading. 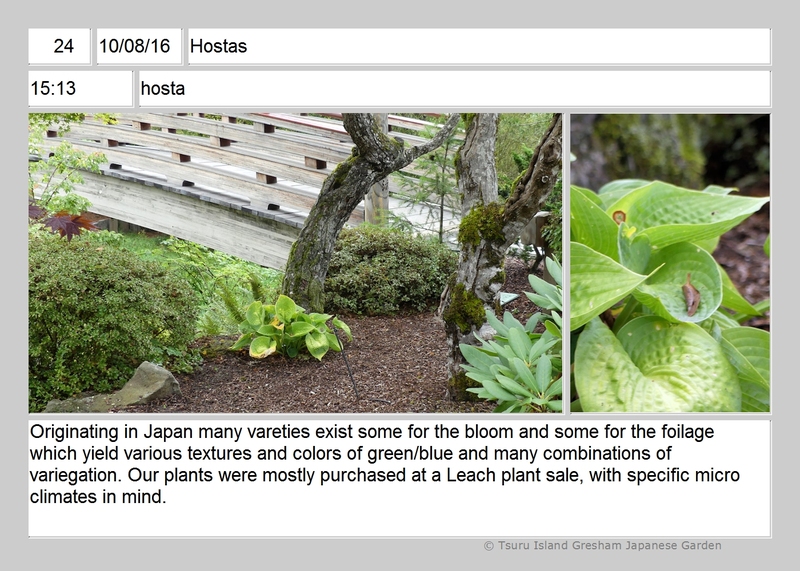 The intent is that these Notes can be taken along on your trip to the Garden to provide plant information. 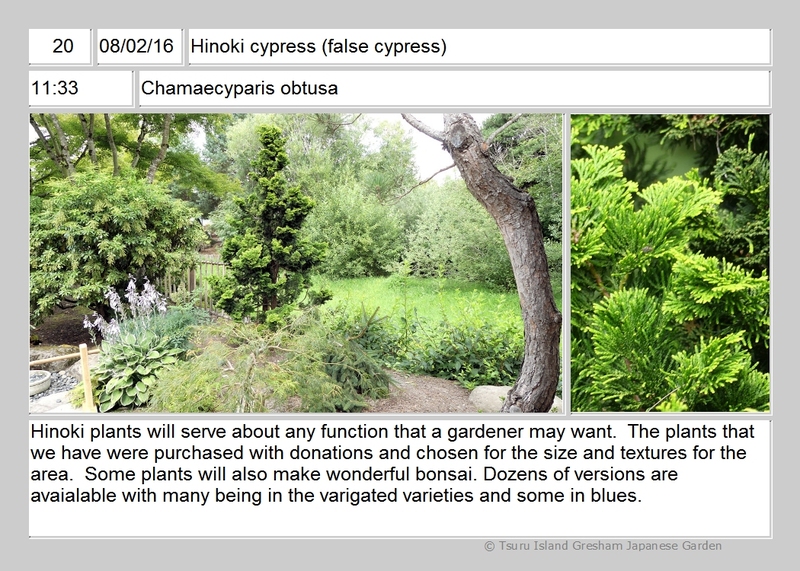 Since the Notes are in digital form they can be viewed on an iPad or Tablet, or printed out as a 5 x 7 photo. 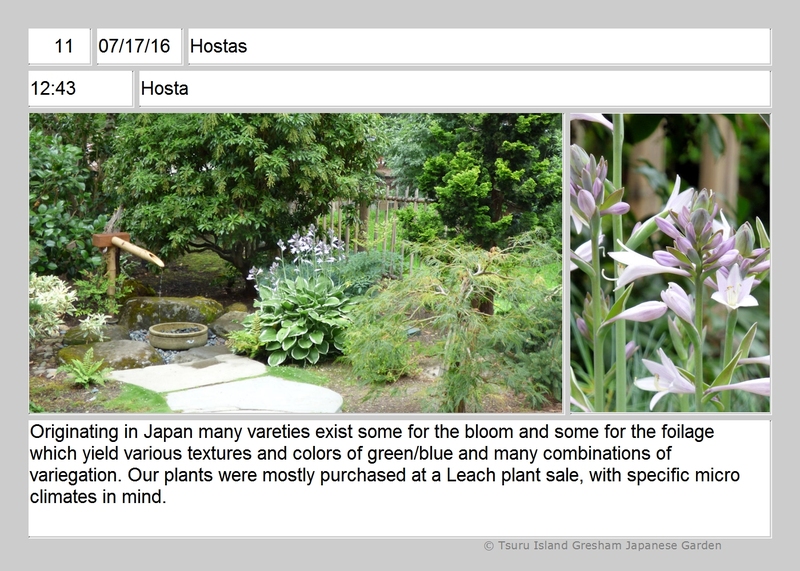 One advantage of the photos is that they can be easily viewed in bright sun light, and convenient and inexpensive photo albums are availability. 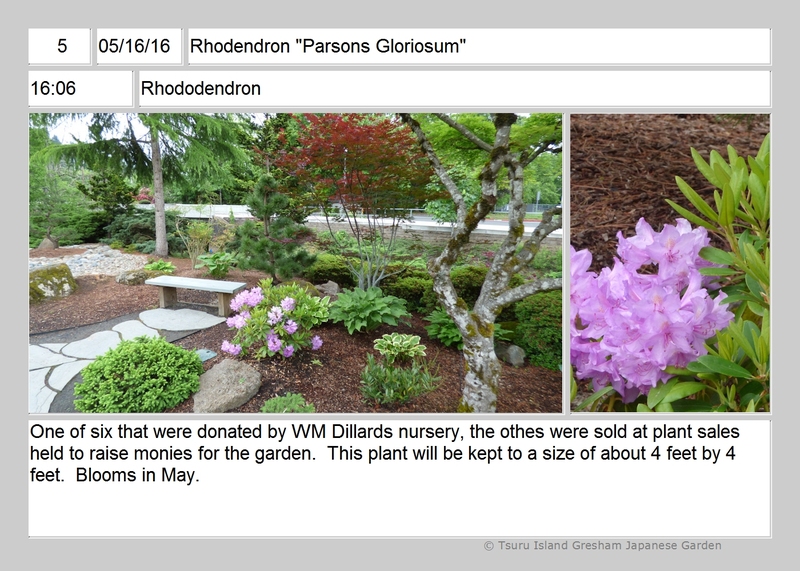 All of the wide-angle and close-up photos of each plant are taken from numbered Camera Spots on the Garden pathway. 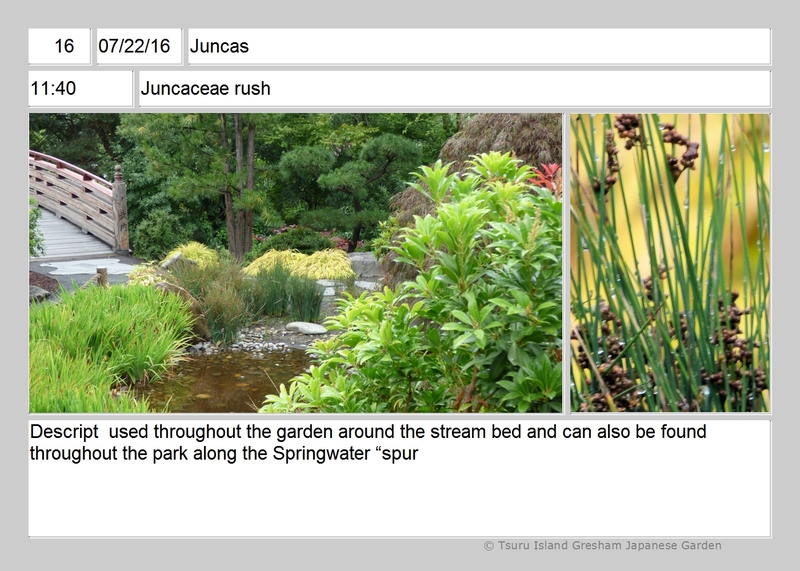 We have provided a Garden pathway map with these numbered spots which can be downloaded. 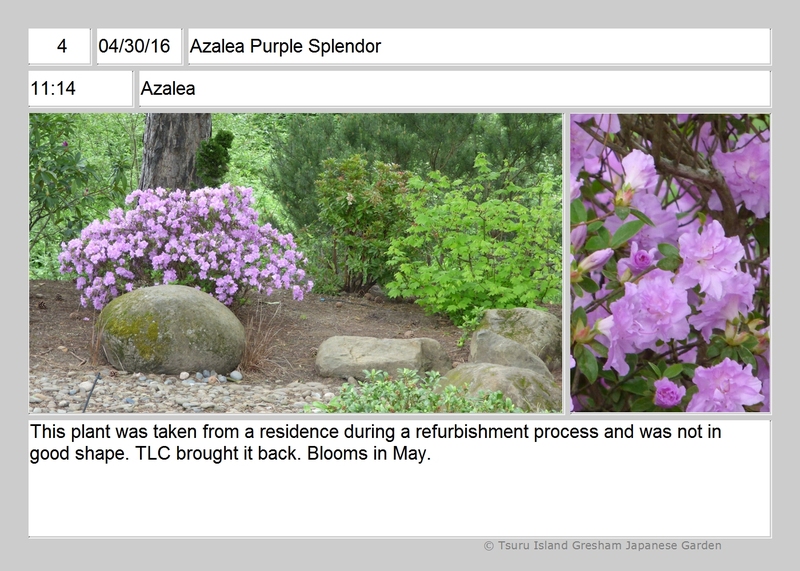 Also provided is are a Garden Note “Date/Time Index,” “Camera Spot Index,” and “ Common Name Index.” The Date/Time is the master index, the Photo Spot allows one to see the plants viewed in orders from each camera spot, and the Common Name index allow one to see the same plants at various locations and times. 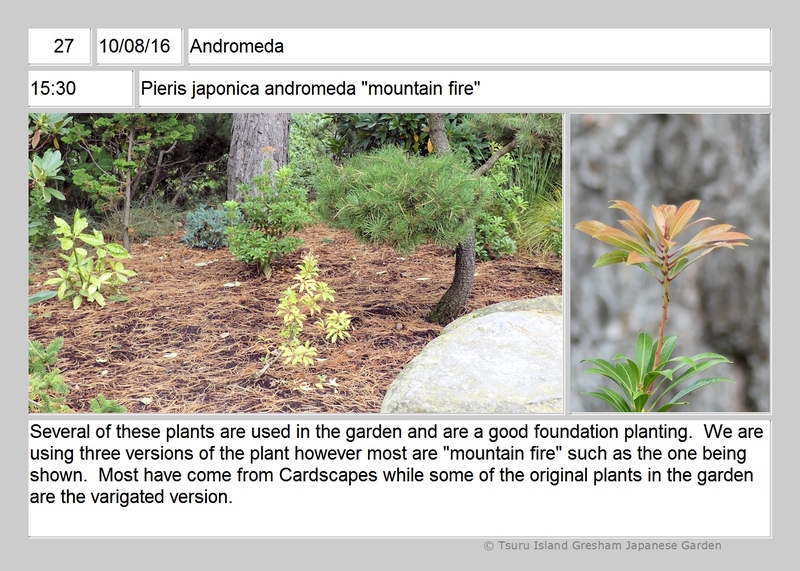 We envision that these Garden Notes may also be used for games and contests.